locate the entrance in our Ben Nobleman Park Community Orchard. Ben Nobleman Park is an important resource for our neighbourhood and its residents. It is a popular green space and the home to Ben Nobleman Park Community Orchard, Toronto’s first community orchard in a public park. It is the site of stewardship days, fruit tree care workshops, festivals and community events throughout the year. It also has our community’s largest children’s play area. But this wonderful environment may be at risk. There is currently a proposal to cut a large slice out of our small park in order to build a southern entrance to the new Eglinton West light rail station. This will result in the loss of a number of mature trees as well as six of Ben Nobleman Park Community Orchard’s most established fruit trees – cherry and apple trees that we will harvest for the first time this year. Many members of our community have worked hard to transform Ben Nobleman Park from a little-used green space into a vibrant community centre. Today we have an orchard with 14 fruit trees, a pollinator garden, and a beautiful new playground designed by local parents. The new entrance would be about 80 square metres – roughly 900 square feet or the footprint of a small house. We believe a busy entrance like this, even if it’s nicely designed and landscaped, will have a negative effect on our park with the garbage bins, cigarette butts and newspaper boxes. Instead, we support the construction of a LRT entrance in a corner of the current police station parking lot. While the police may lose up to 13 parking spots, alternative parking spots can be found. Our preferred option is option number 4 – which locates the southern entrance in the police station but still allows the police an exit directly onto Eglinton Avenue West. Our least preferred options are options 1, 2, 2a and 2b – as all of them locate the entrance in our park. There is room on the survey for additional comments. Please tell the TTC clearly that you do not want an entrance to the light rail in our park. Please help us protect Ben Nobleman Park. Eglinton Avenue will see the following significant improvements to public transit service over the next decade. Metrolinx is investing $8.4 billion in the design and construction of rapid transit in Toronto, including the Eglinton-Scarborough Crosstown line. 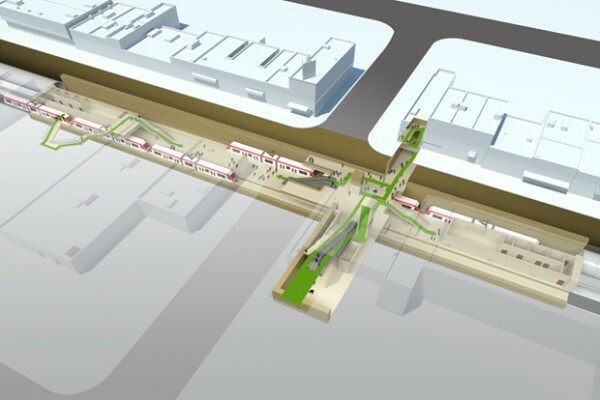 It’s a 25-kilometre rapid transit line that will run through the heart of Toronto. Running along Eglinton Avenue, the transit line will connect west to east from Jane Street/Black Creek Drive to Kennedy Station. Nineteen kilometres will be tunnelled underground, easing traffic and air pollution. At Eglinton West Station (Allen Road) and Eglinton Station (at Yonge Street) The Crosstown line will be built to cross underneath the existing subway lines. The Crosstown will then continue to the Scarborough City Centre via Light Rail Transit (LRT) which is a structure completely separated from traffic. Construction of The Crosstown began the summer of 2011. Crews will lower the tunnel boring machines into the ground to begin tunnelling eastward in late summer 2012. The Crosstown line is scheduled to be completed and operational by 2020. The Crosstown will cut travel time significantly, and conveniently link to existing TTC transit lines and GO Transit stations. Travel on The Crosstown from Kennedy to Black Creek is projected to take 35 minutes. It will take only 45 minutes to travel from Scarborough City Centre to Black Creek. This is less than half the time it currently takes to travel the same route. The main station entrances will all have elevators and escalators. and Close Circuit TV monitoring. 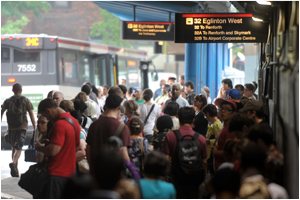 For additional information, please visit the Eglinton-Scarborough Crosstown website. 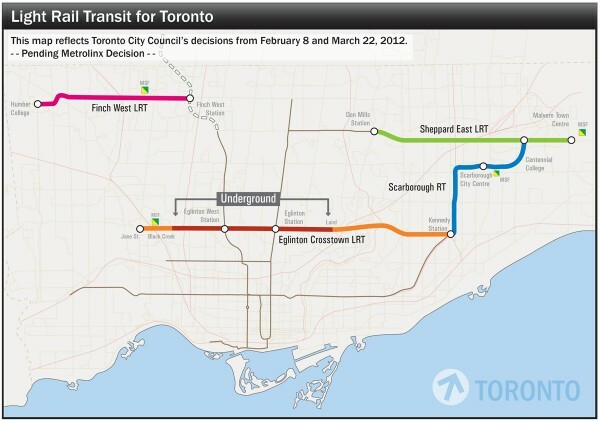 The TTC (Toronto Transit Commission) is contracted to deliver The Crosstown project on behalf of Metrolinx. At the preliminary Eglinton West/Allen Road station design Open House on February 2nd, 2012 and in the online consultation, local residents highlighted their preference for a south-side station entrance to access the future Eglinton-Scarborough Crosstown. Please review the complete consultation report. Have your say regarding the south side entrance – now! A final decision on a south side entrance will be made over the coming months based on several factors including cost/overall project budget, community input and engineering factors. Please fill out the survey and let us know what you would like to see. Thank you! If you would like to view the presentation in full screen press the in the bottom-right corner to expand presentation. 2.More available space for the proposed utility relocates and construction staging area. 3.No impact in Ben Nobleman Park or 13 Division Police parking lot. 1.No Southern Entrance into Eglinton West (Allen) Station. 2.Pedestrians must cross Eglinton West to enter station West (Allen) Station. The green roofs in Option 2 & 2A integrate the building into the park. 4. No major interference with existing or relocated utilities. 2. Excellent south access into station. 3. Allows for future development to have access to station. 1. Significant conflict between proposed stairwell and relocated146 sq. m. stair construction sanitary and storm sewers. 2. 3 parking spots lost for Option 3 and 14 spots lost for option 4. 3. Severe police mobility disadvantage for option 3 due to elimination of police vehicles direct access to Eglinton West Ave.
“Please Get in Touch with Us!